Color:Black+Grey Color:Black+Grey Have you ever wanted to have a portable and multifunctional gadget that can assemble various functions such as music, calling and charging? Here, Titita Bluetooth FM Transmitter will meet your requirements, allowing you to travel more convenient. The 1.4 inches large LCD screen shows incoming caller number, voltage level, volume, FM frequency and name of song if you play music from TF card or USB flash disk. Dual USB ports allow you to charge two devices at the same time, no need to worry about power shortage. ▲ After restart the player of the FM transmitter, some moblie phones may not have the function of automatic connection, please connect manually. 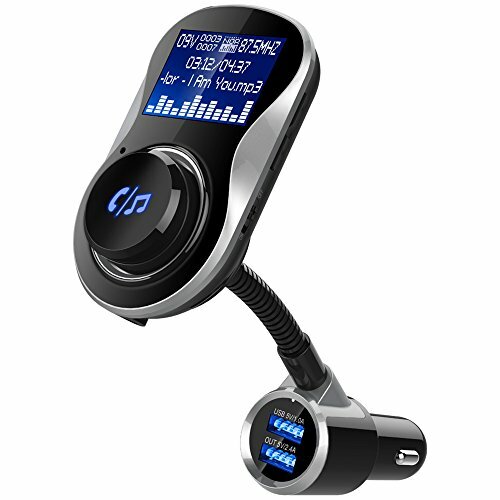 ▲ This Bluetooth FM Transmitter is compatible with more than 95% of the mobile phones and other devices on the market. If there is something wrong with connection, please inform us timely. ▲ Please don't use the Bluetooth FM Transmitter in high or low temperatures, dusty or humid environments.